This1998 Toyota Spacia we have named Bambino. Cute and clean traveling van for backpacking on a budget. It is easy to drive manual and petrol vehicle. 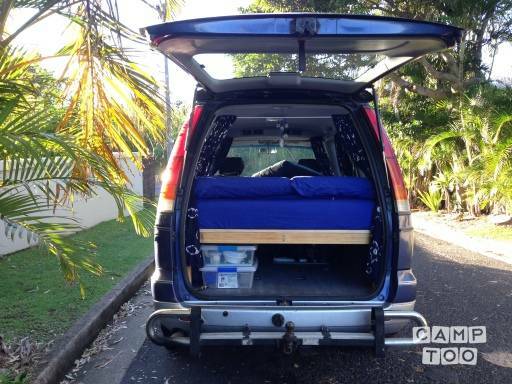 Want to go on adventures to the surf, waterfalls, markets, Nimbin and also have somewhere to sleep? Bambino is our little van for adventures on a budget. Bambino is clean, zippy and easy to drive, equipped with everything you need, ready for adventure. Gas cookers, table and chairs, camping and picnic gear, and esky. Inside the van is a double bed, crisp and clean linen, feather doona (duvet) and extra blanket, and curtains for privacy. Beach and bath towels are also provided. Find one of the many great places to stay in the van around byron, from beach front camping grounds, riverfront serenity to freedom camping in the wilds. There are great camping spots in the areas surrounding Byron.